Fun loving travellers may be tempted to schedule their travel to coincide with the festivals in this article. Explore events around the world, from mega music raves to quirky cultural experiences. Festivals are a great way to experience a destination in a unique and different way. And with several hundred festivals all over the world every month – there are plenty to chose from! This post pulls together a collection of the Best Festivals Around The World in 2017 and showcases 3 festivals for each month of the year. Whether you’re looking for the ultimate cultural experience, the glamour of a film festival or the sheer joy of a music festival – there is something here for everyone. Warning. This post will fuel your wanderlust – and make your Festival Bucket list super super long! With hundreds of festivals all over the world throughout the year, trying to pick just one can be overwhelming. Use this post as your ultimate guide to the best festivals in the world for 2017 – complete with recommendations from travelers who have experienced and loved each festival. Scroll through each month to see if there are any that fit with your plans! The name of the festival literally translates as ‘The Mountain Roast’ and is where on the 4th Saturday in January each year, the dead grass on the hillside of Mount Wakakusayama is set ablaze – but until after one epic fireworks display. There are two theories of the evolution of the festival. The first claims that the burning of the mountainside began during boundary conflicts between Nara’s great temples (Tōdai-ji and Kōfuku-ji), while another claims the fires were used to drive away wild boars. Once set ablaze the mountain can burn for up to an hour and because of the mountains elevation it can be seen from anywhere in the city. Travelling is really a wonderful experience, it helps us relieve from stress and allows us to relax and enjoy ourselves away from our work. But don’t get too excited, before you can actually go on vacation, it needs thorough planning before you can actually enjoy. It is the best time to plan your next holiday getaway! Not only you can save money but for sure, you’ll avoid the Holiday rush! Instead of shoveling snow on Christmas, entertaining the in-laws at Hanukkah or unsuccessfully looking for a party on New Year’s, you could be drinking eggnog poolside; singing carols on deck, while overlooking the sea; eating multicourse holiday meals, prepared by professional chefs; and enjoying New Year’s Eve with enthusiasm (and with no worries about driving home). That’s right. You could be celebrating on a relaxing, warm-weather cruise. Cruising during the holidays is anything but the typical week-at-sea experience you might find during less festive times of the year. Many cruise lines — and officers, staff and crew — embrace the holiday season with a cheery vigor that goes beyond the symbolic Christmas tree, occasional Santa appearances, elaborate turkey dinners and New Year’s Eve midnight countdowns. But while celebrating a holiday at sea means you can avoid the associated cooking and cleaning — not to mention escaping from crazy relatives or bonding with the family members you actually do like — you’ll have the best experience if you put a little effort into planning the best cruise for your brood and setting the right expectations. From choosing the right cruise to packing advice and tips on what to expect onboard and off, here’s everything you need to know about spending a holiday at sea. 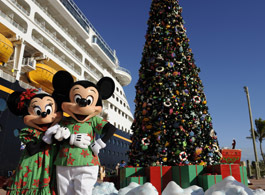 In general, Christmas and New Year’s holiday cruises are often the most expensive of the year. Cabins at this time are usually in high demand by passengers because schools are on break, and many families want to take vacations during these weeks. Several large cruise lines confirm ships in their fleet are at their highest occupancy at this time. However, some lines do offer flash sales or loyalty club promotions, so check cruise line Web sites, sign up for e-mail newsletters, and reach out to a cruise travel agent to find out about specials. You might be surprised at how affordable a warm-weather holiday can be, even when booking a few months in advance. But before you book that last-minute, rock-bottom rate, make sure you can afford the airfare to your departure port. In general, if you want to lock in your preferred itinerary, ship, cabin and dining group and have as much time as possible to look for affordable airfare, book early (nine to 12 months in advance). The downside? You might end up paying a premium for this level of security. These days, however, most lines announce their best deals early and will adjust your rate if public fares go down after you book. If price is your foremost concern, you can wait for deals to come out, often within three months of sailing. But you might get stuck in an inside cabin or with your family spread throughout the ship, rather than in adjoining cabins. When booking airfare, remember that flights at this time of the year can be outrageously pricey and often are oversold. Try to reserve your flights early (but not too early, as flight times can change after you book), and you might want to consider all your options, such as using frequent flyer miles or buying the cruise line’s air package. If booking on your own, consider a low-cost airline or an airport a little farther from home. You might even want to choose a cruise departing from a nearby homeport so you can avoid flying altogether. Another tip: At this time of year, it’s a very good idea to fly into your departure city a day early. With flights so crowded, a delay or cancellation due to weather or overbooking might cause you to miss your cruise. There’s no guarantee you’ll get on the next flight out if there’s a problem with yours.